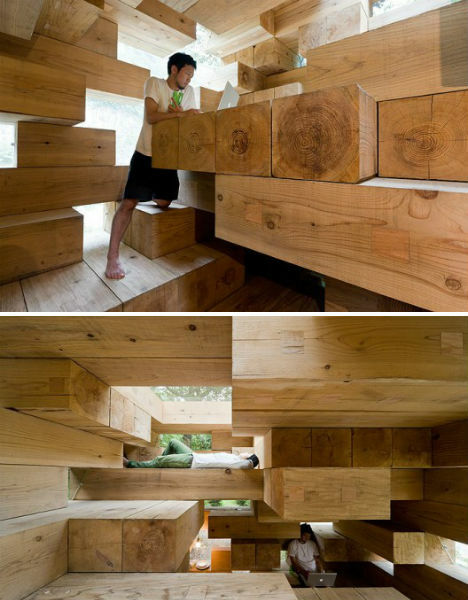 Explore the seemingly endless platforms and hidden nooks of this Jenga-like house, conceived as an example of “ultimate wooden architecture” by Sou Fujimoto Architects. 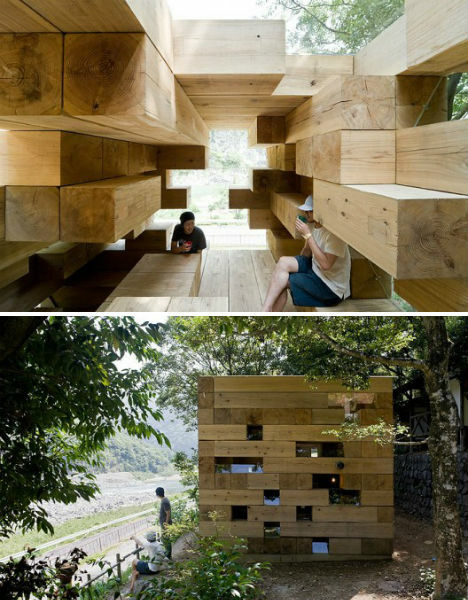 Located in Kumamoto, Japan, ‘Final Wooden House’ consists of massive wooden blocks randomly stacked together with irregularly shaped openings covered in glass. Forget conventional rooms and staircases – this home is like a massive playhouse, requiring the inhabitants to climb from one block to another. 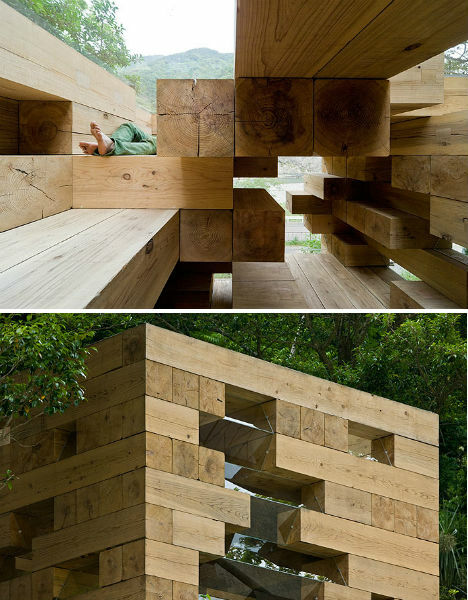 The wooden blocks offer all manner of supports for various activities, but you’ll have to use your imagination to determine just how to use each one. The architects were inspired by primitive conditions before architecture, like cave dwellings, where humans made the most of the surroundings as they found them. 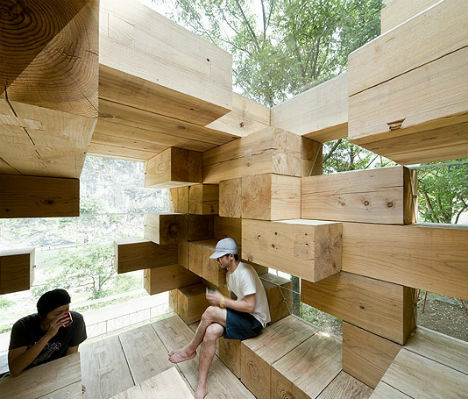 Of course, climbing around inside this minimalist jungle gym requires care, an able body, and perhaps a hard hat. Getting from one area to another in the dark might be an intimidating task. The house may not be terribly practical, but what it lacks in livability, it makes up for in pure fun. Home prices have gone up by more than 4 percent in 2012, and many professional forecasters anticipate that we will continue to see gains around 3.1 percent in the upcoming year. The December 2012 Zillow Home Price Expectations Survey found that optimism is strong among more than 100 economists, real estate experts, and investment and market strategists, reports National Mortgage Professional Magazine. While the fate of the mortgage-interest deduction and the Mortgage Forgiveness Debt Relief Act of 2007 remains unknown, there are still signs for positive growth in the housing market. As housing continues to recover around the nation, some regions have become more favorable to sellers, and others more optimal for buyers. According to Zillow’s analytics, sellers’ markets tend to be clustered in the West, while buyers’ markets appear to be more prevalent on the East. In a sellers’ market, homes move more quickly and at prices close to the asking price, while in a buyers’ market, houses tend to stay on the market longer and are sold at prices lower than the listing price. The number of homeowners with a mortgage in negative equity fell below 30 percent, reports Forbes. As home values continue to rise in the upcoming year, more underwater homeowners may take the opportunity to sell, which could both slow the upward trend in prices but also ease tight inventory in metro areas like Phoenix and Miami, where buyers have very slim pickings. Qualifying for a home loan at historically low interest rates have saved households money. Between 1985 and 2000, Americans spent an average of 20 percent of household income on mortgage payments. The spending spiked to more than 24 percent before 2006, and fell to 13 percent by the second quarter of this year. If rates continue to stay low, homeowners and buyers will be able to continue stretching their dollars toward the purchase or refinance of a house in the new year. The kitchen work triangle can feel like a mystery to some homeowners. The term is thrown about quite often in kitchen design — but how necessary is it? Since appliances can easily be the most expensive part of a kitchen remodel, deciding what can fit into your new kitchen and where it will go is an important and personal decision. These professional tips from four Houzz architects and designers can help you figure out an appliance layout that works for you. The PHSI in the Northeast rose 5.2 percent to 83.3 in November and is 15.2 percent above a year ago. In the Midwest the index edged up 0.1 percent to 103.8 in November and is 15.2 percent above November 2011. Pending home sales in the South were unchanged at an index of 117.2 in November and are 13.9 percent higher than a year ago. In the West (see Greater Seattle stats) the index rose 4.2 percent in November to 110.1, but is 3.2 percent below November 2011 with inventory constraints limiting sales. How ‘Normal’ Is the Housing Market? The housing market is poised for a “gradual but steady” recovery in 2013, with housing starts, permits, prices, home sales, and builder confidence all on the rise, the National Association of Home Builders reports. But how close to “normal” is the housing market? Remodeling has returned to normal levels, says David Crowe, the NAHB’s chief economist, using the 2000-2002 period as a benchmark for normal levels. Mutlifamily production is 69 percent of normal. “It’s the single-family market that has the farthest to go, standing at only 40 percent of what is considered a typical market,” Crowe says. The housing market is expected to make big strides to getting closer to more normal levels, due mostly to a rise in home prices and household formation that is adding to demand, the NAHB reports. Single-family housing starts are forecasted to reach 534,000 units this year, up 23 percent this year from 2011. For 2013, single-family housing starts is expected to jump 21 percent in 2013 and another 29 percent gain in 2014 to 837,000 units. Multifamily production is forecast to jump 31 percent this year to 233,000, and gain another 16 percent in 2013 to 270,000. New single-family home sales are forecast to post a 20 percent jump this year to 367,000 and to rise another 22 percent in 2013, and reach 607,000 by 2014. I’ve actually had to call Critter Control due to raccoons making their home in my attic. This is an easy to use app in the event you have uninvited creatures around your home. You can use the Critter Lookup App for iPhone to figure it out! Browse the catalog of small, medium and large mammals, snakes and reptiles, insects and birds, or use the Photo ID feature to snap a quick picture and have it emailed directly to a Critter Control representative who will reply with an identification.